For most Londoners the Underground is the quickest and easiest way of getting around town. Millions of people descend into the oldest metro service in the world every day, travelling from A to B thanks to wonders of engineering and design. Everyone knows they are going underground, but just how deep? If you would like to download a PDF of all the diagrams, click here. 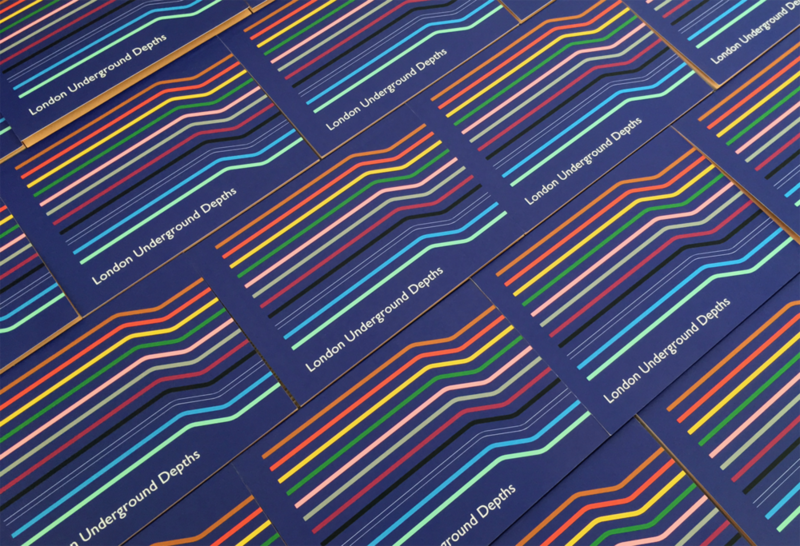 Down Underground also has an online shop! One day, on my commute to work, I wondered – "How deep underground am I?" Escalators, stairs, lifts, mazes of tunnels… no idea. I searched the internet – a few people have done curiosity maps and played with Beck's design, so surely one of depths must exist. Trawling the internet, seeking to satiate my curiosity, I found nothing. So my curiosity turned into a mission – I would create these. I set on to research – I got an excel sheet from TfL, which had all levels of all stations, but specified in metres according to the London Underground Datum (which basically means that 100m are added to all measurements to avoid having negative numbers). Engineers might be fine with these values, but the average person needs ordinary, straightforward measurements. So I swapped my researcher cap for my analytical one and made sense of the measurements for all 270 stations, ground level and platform level. With all the data prepared, a way of visualising it was next. Taking a page from Beck's book, I couldn't represent distances between stations to scale, as that would have render most diagrams impractical. The only accurate scale would be that of depth. So I set off and created the first diagram – the Victoria line, one of the simplest. Once I got on to the Central line I realised my approach had to change – some lines have different branches, and as the diagrams represent a unique path, I couldn't create a single diagram for the whole line. Excel page of all stations for the Victoria line, with North and Southbound platform levels. The answer arrived via the Circle, District and Hammersmith & City lines. These have so many different branches that you need to be certain of which service you get. And this was when the obvious dawned on me. Sure, lines branch out, but trains go from A-B. What the diagrams had to represent was not the lines but the services of these lines. So I checked all the services from all the lines (33 in total) and re-created the diagrams accordingly. The obvious solution at the time, it seemed, was for me to choose, within each specific Underground line, the minimal number of A-B journeys that would cover all of its stations. Creating the diagrams was time-consuming. So many numbers and calculations, double- and triple-checking. Once the diagrams were completed they didn't seem right – yes, I knew all the depths of the stations, but the way I'd displayed them didn't seem correct. Once the diagrams were complete, I created a pocket booklet version of the same, so I could follow my journey underground with ease.